Discussion in 'Stage Management and Facility Operations' started by tdtastic, Nov 6, 2018. All public buildings (educational in this case) are required to have battery-powered emergency lighting and exit signage in ADDITION to any gasoline generator that might supply back-up power to said building. RIGHT??? We hosted an event in our space over the weekend where hundreds of people moved into and out of our auditorium and surrounding spaces. In the middle of one of the presentations, our building experienced a complete loss of power. After the usual "few seconds" our gasoline generator did NOT kick in, which would have at least powered my auditorium's house lighting and partial fluorescent lighting in the hallways. For nearly an hour, the whole building was plunged into total darkness. Our staff was totally at a loss of what to do. We got through it but not without many (and justifiable) complaints from the patrons and participants. I was told that our generator has been on the fritz for a while and that the school is waiting on the funds to be approved in the state capital. Insert massive eye-roll. I'm livid because we have been allowed to put on shows here when the generator-powered egress lighting and signage has NOT been functional. I was told we no longer have a battery backup system; I was here to witness their removal years ago. This sounds like total crap to me - am I wrong?!? Our campus looses power at least ten times a year -- it's something systemic in the grid where we are. I'm PISSED because someone here has known of the faulty generator and lack up backup for months but has done nothing to help us implement some temporary precautions until our generator is replaced!!! Aside from the flashlight in my pocket I have NO way to light our auditorium in the event of a power loss. I will be stuck with six hundred people freaking out in the dark with no way to address them over a mic and no way to light their way. What can I do in the meantime!? I have events in here all this week and I honestly fear, knowing what I know now about our egress lighting, that I could be considered complicit if there was an emergency when I knowing let people assemble here when we aren't in compliance with federal egress regulations. Do I need to calm down about this?! Is this something any of you have experienced? Before I go citing NFPA or OSHA standards I just need assurance that my gut instinct is correct: that regardless of specific regulations, it is completely UNACCEPTABLE that our ENTIRE building be plunged into abject darkness for an indefinite amount of time whenever our building experiences a total power loss. Am I crazy? Am I? Section 5-9.1.2 gives you 10 seconds from power failure to when the alternative source should supply power to emergency lighting. I will say personally that it's unacceptable to continue to operate without a working generator and automatic transfer switch, and no battery backed system in place. I'm sure that the local AHJ would have similar feelings. The only possible comfort is that for the most part, nearly everyone in the room will have a flashlight in their pocked (cell phone). Not ideal at all, and not something that should be relied on. But something to think about if a situation were to occur. macsound and Ben Stiegler like this. @tdtastic If / when you install a UPS to carry your LX and audio boards through brief outages, consider having your production intercom system and "God mic" on the UPS as well so you can coordinate with your SM and crew as well as give instructions to your patrons. As to assessing your state of craziness, that's beyond my scope. No. Unless required by local ordinances, NFPA says you need one or the other, per NFPA 101. There are some exceptions, such as that you must have battery lighting in the generator room in case you need to diagnose an issue during a power loss event. Your system fails the requirement in NFPA 101 to transition from normal power to emergency power within 10 seconds. This would be readily apparent and well known if the code minimum requirement for regular testing of life safety backup systems was performed. With some exceptions, this is every 3-5 weeks per NFPA 101. Get facilities on the horn. If facilities won't do something, escalate to higher levels in the school system. If in doubt, ask your AHJ for direction, in which case they will gladly shut you down and cite your employer until they are compliant. tdtastic, RickR, Ben Stiegler and 1 other person like this. proud of you for speaking up! Its often unpopular to be the safety person doing the right thing. macsound, tdtastic and RonHebbard like this. Go buy yourself a megaphone and some really good flash lights in the mean time. If you don’t get yourself crap down before hand. Removing the battery lights is just silly I agree with you there. When I ran facilities in WI. I met with our fire guy every 6 months to replace extinguishers and the batteries in all the signage that had them. He is an ex fire chief and kept up with all the new laws. My goto when the actual fire marshal came around and started rattling off opinions versus code I was ready with proper retorts. Definitely go through proper channels before you go and nark on yourself though. No ultimatums. Just say calmly and collected this needs to be done ASAP not when the money comes in. Give it a few weeks and if they sit on their hands pull your trigger ideally a few weeks before you have a big show so it can get fixed in time. I strongly advise that you use your best diplomatic voice. Schools are typically large employers and can have enormous political and moral power. Gather evidence, allies and focus on facts along with those code citations. Maintain a professional stance and calm exterior. tdtastic, RonHebbard and Amiers like this. Removing the battery lights is just silly I agree with you there. It’s not uncommon. Batteries are expensive to maintain. They corrode in place, have to be manually tested and inspected and replaced, one at a time. In newer all LED venues it’s a little less unusual to see batteries, just because a single 550W inverter can do a whole venue’s worth egress lighting and you can remote the battery somewhere accessible instead of sending someone around a building with a ladder and screwdriver. It’s much more of a maintenance nightmare when you have the batteries all over the place, both in labor and in parts. Most new construction schools I work on have life safety standby generators and have foregone all battery powered backup lighting. Just have to keep up on the maintenance and regular testing. With all the required lighting control panels to comply with energy code, it’s actually pretty economical on a campus of any moderate size to set up your LCP panels on normal/emergency power, and to do load shedding and lighting dimming during power loss events to get as much runtime on the gen as is possible. With all of the energy code requirements for scheduling, daylight harvesting, receptacle controls, local dimming, variable CCT control, and occupancy detection, the days of architectural light fixtures being wired directly to line voltage switches and back to dumb circuit breakers are coming to an end. As for generators, I just did a noise impact study on a building with 3 2M gens. They use 2 for the full building loads and the third is a redundant spare. On another campus our client is running one 2M gen to keep the campus online long enough for them to roll portable gen trucks in to tie into their ATS, which minimizes their install and maintenance costs of having multiple generators to keep the buildings online for x number of days when they go into hurricane command and control mode. Also just did a library where they have an 750kW generator to keep all the building’s HVAC online so they keep the paper products in a humidity controlled environment throughout the full duration of an outage. Can’t do HVAC off of batteries. Increasing number of reasons to prefer a generator over scattered batteries. In my hurricane territory as well, schools often double as hurricane shelters so these systems are already being installed might as well get the most bang for the buck out of them. Doesn’t change the fact the the OP’s generator is non-compliant, but you will see far fewer batteries in exit signage and egress lighting in years to come. Jay Ashworth, tdtastic and RonHebbard like this. Insurance claims are quite a bit more expensive if something happens. They took it out then they should of replaced it with something newer. Or at the least condensed if they were having cost issues. Yes there was a Geni but it doesn’t sound like it’s been kept up with at all or it has been “looked” at by in house Operations and not real technicians. 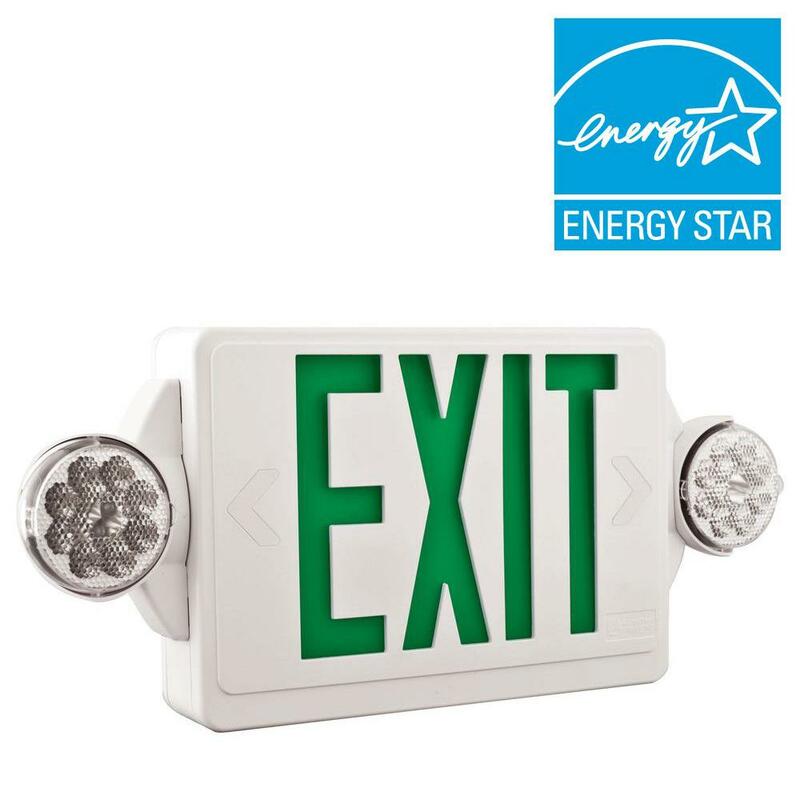 For illuminated exit signs, go tritium. Up to at least 20 years, no wire, battery, generator. RickR and tdtastic like this. 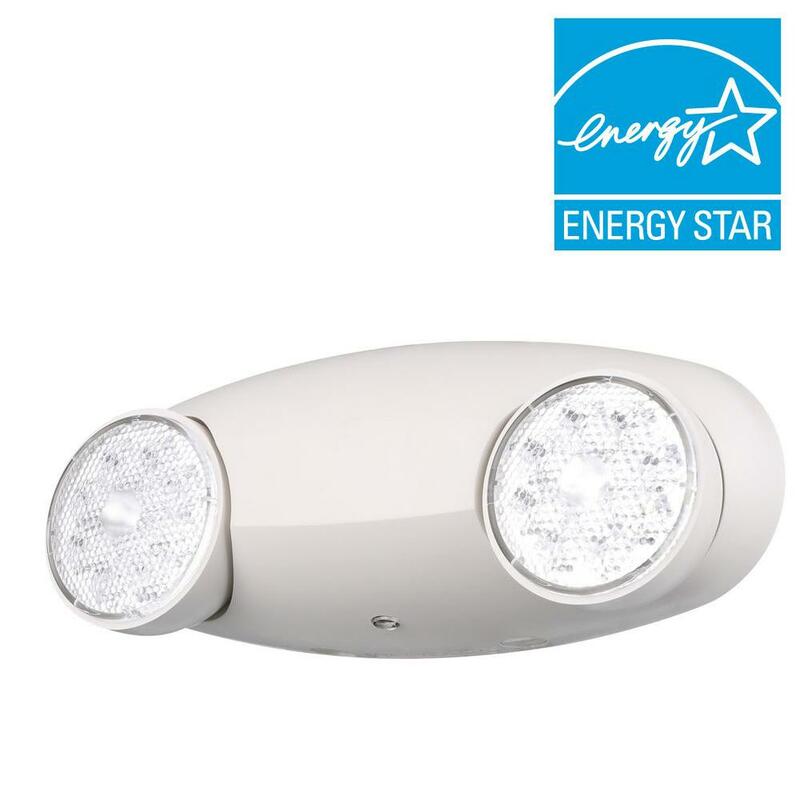 This type of exit light isn't expensive, and a few can a cover a fairly large area. It doesn't take much light to safely get a crowd out of the building. Having mothered many generators, I can honestly say changing batteries in a half dozen lights every 5 years is preferable to the maintenance rituals of a generator. The generator service truck costs a lot more per hour than the building custodian or district electrician. Neither of those links worked for me. Are they both battery powered? While an exit light over a door or opening is indeed easy to get to, the pendant cylinder or wall mounted bug eyes over fixed seating on tiered risers us not so easy. And not just batteries in 5 or 10 years but pressing the test button periodically. Code requires minumum 0.2 fc over all aisles, cross aisles, etc, in assemby seating, and thats very hard to get in midfle of many auditoriums. With LEDs, I'm a fan of central inverters. The one downside is when that battery has to be replaced in 5 or 10 years, its several thousand dollars. In a typical new hs theatre, i may have 20-30 fixtures designated for emergency. True that if not a normal light that bypasses or transfers for em, maybe 2/3 or half, but still discouraging to get to all for testing. (Once a year?) Plus i like to include step and aisle lights - hard to see the steps in dim light when the aisles are crowded and blocking light to floor - and that's tnverter or generator for large numbers. CORRECTION: emergency i more than 0.2, which is required when occupied. Its more like 1 fc for em with a minimum level and maximum contrast ratio. Ill look it up when at my desk and will post. 7.9.2.1 Emergency illumination shall be provided for a minimum of 11⁄2 hours in the event of failure of normal lighting. 7.9.2.1.1 Emergency lighting facilities shall be arranged to provide initial illumination that is not less than an average of 1 ft-candle (10.8 lux) and, at any point, not less than 0.1 ft-candle (1.1 lux), measured along the path of egress at floor level. 7.9.2.1.2 Illumination levels shall be permitted to decline to not less than an average of 0.6 ft-candle (6.5 lux) and, at any point, not less than 0.06 ft-candle (0.65 lux) at the end of 1 1⁄2 hours. 7.9.2.1.3 The maximum-to-minimum illumination shall not exceed a ratio of 40 to 1. Note also - summarizing -a monthly 30 second test of all emergency lighting is required and an annual 90 minute test is required. There is a half page of code on this testing, allowing self tests, computer testing, reporting, etc. What I was suggesting is a few of a sub $100 item. Replacement batteries are like $20. I see this solution used in performance venues all the time in my part of the world. All placed within a step ladder's reach. I just wonder how well these light an aisle in the middle. Better than nothing - sure - but it seems too often as an industry we settle for just-get-by or almost-get-by solutions. In this case - obviously lots of places do not meet code. What you propose may remedy that but just keep in mind that just meeting code is a D-- passing - and can't we aspire to at least a B average design? And I'll never claim I have not fallen to the same trap - that doing something for less doesn't have its appeal - but dangerous to aspire to as good. I've seen them in new facilities. I wonder if a design factor is a whether the aisles are flat or gently raked versus having steps? It seems to me that steps would require a higher and more evenly distributed light level to prevent accidents. No codes I'm aware of distinguishes between level aisles, aisle ramps, and aisle stairs for illumination. PAR36 lamps are still used for emergency lighting, and can cover the center of an auditorium. No LED, though. Also, NYC and Chi have additional requirements for em lighting. As for testing, all equipment each month, including a run test of the generator. Can't recall if a load test is required for the genny, and if so how often. Transfer switches also need checked but that takes a specialist. Luckily UL924 bypass systems and the incredibly small loads of LED have just about eliminated the need for transfer switches.